Thirteen years ago, when New Orleans was at perhaps its lowest point, an injured San Diego Chargers quarterback came to us, and the New Orleans Saints-–and our city– haven’t looked back since. Just last month, when playing at home against the Washington Redskins,13-year Saints veteran Drew Brees threw a 62-yard touchdown pass to wide receiver Tre’Quan Smith to become the NFL all-time passing yards leader, surpassing NFL Denver Broncos Peyton Manning’s mark of 71,940 yards with a career total of 71,990 yards. Brees, originally from Austin, Texas, finished his successful football career at Purdue University by signing with the San Diego Chargers in the second round of the 2001 NFL Draft. He became their starting quarterback in 2002 and a free agent in 2005. Unfortunately, he suffered an injury to his right shoulder during the last game of the regular season. When the Chargers refused to increase Brees’s salary for the 2006 season, he met with the New Orleans Saints and the Miami Dolphins. Concerned about the injury to Brees’ arm, the Dolphins declined to make him an offer and Brees signed a 6-year, $60 million contract with the Saints in March 2006. 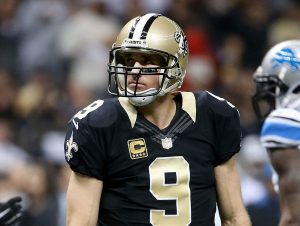 When Brees was signed to the Saints, the city was on the rebound from Hurricane Katrina. In his first season with the Saints, the team went from a record of 3-13 to a record of 10-6 and won the NFC South division title. Brees would also lead the Saints to their first Super Bowl win in 2010, defeating the Indianapolis Colts 31-17, where he tied a Super Bowl record with 32 pass completions and received the honor of Super Bowl Most Valuable Player. Just a year ago Drew and Brittany Brees donated an all-inclusive playground in Audubon Park (at St. Charles Ave. and Walnut) for kids with varying needs, which promotes interactive physical, cognitive, visual and hearing experiences. We’re looking forward to seeing what we’re sure will be more of his commitment to the city that loves him. Drew Brees’s passion on the field and for helping others is unmatched. Brees continues to be one of the greatest quarterbacks in the NFL and knows what it takes to show love for the game and love for one’s city. Without a doubt, Drew Brees has helped a city that has faced great hardship and given the people of New Orleans something to celebrate each football Sunday– and beyond.